Dr. Karen Bammel Ph.D., Dr. Leslie Miller Ph.D., Dr. Matthew Reis Ph.D. Regional economies are highly dependent upon entrepreneurial endeavor success for growth, but the success rate for entrepreneurs is low (Gugliada, 2003). This quantitative group comparison research identified specific leadership characteristics that differentiated successful entrepreneurs from those starting entrepreneurial endeavors. 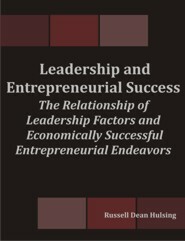 Analysis of the research results revealed that an accepted contemporary leadership model might support programs targeting entrepreneurial success rate enhancement. A general study population of entrepreneurs in the western New York region limited the research scope. Using the self-rater Multifactor Leadership Questionnaire (MLQ) form-5X (Avolio & Bass, 2004), data was gathered from a stratified sample that consisted of startup entrepreneurs (N = 76) and verified successful entrepreneurs (N = 34). Multi-level data analyses using F-tests, ANOVA, and graphic techniques extrapolated results. Specifically identified by the study were 11 leadership characteristics that differentiated startup and successful entrepreneurs as well as a major leadership factor that differentiated entrepreneurs from a normative leadership sample.